← Learning advanced bike skills. Or look Mom, no hands! And we’re both glad he won the negotiation because in the past year, we’ve discovered so many uses for our Bromptons. Pack light and skip the hassle of schlepping luggage through the airport. Just attach the frame mounted front bag and roll your partially folded “cart” through the terminal (we haven’t had the guts to try riding, but maybe we’ll try some time late at night). Skip ground transportation headaches. Simply hop on and ride directly from the airport to your destination. But more than air travel, the Bromptons have done it all–from Zipcar pickup to train travel to multi-modal bus-bike trips–with ease and grace. Lately our Bromptons are shining from another use: easily transportable kid pick up. If you know us, you know we’re big fans of the Xtracycle. For years we’ve been toting the kids around on the snapdeck as “cargo.” Even when they got bigger and started riding on their own, we could still carry them when needed (at night, impromptu appointment pick up, etc). But these days they are lots bigger and carrying them too far is a real chore. There’s also the anti-cool factor of riding on the Xtracycle for our oldest–unlike adults who think hitching a snapdeck ride is the height of hip, she does not want to be seen being carried by a parent. Here’s an example: our daughter recently had an orthodontist appointment in the middle of the school day. She normally walks to school so Anne had to figure out a way to transport mom and daughter to the appointment together without resorting to carrying her. Because of our deep bicycle quiver, she had a bunch of options. Back of Xtracycle: Nope. See above. Tandem: Currently set up for our 8-year-old with a kidback crank adapter. Too small for her. Embarrassing. And babyish. Did we mention embarrasing? Drag her bike up the hill on the Xtracycle? Sure, that works, but it’s slow and makes the steep climb to school a bit more awkward. And then we have to deal with her bike after the appointment. Tim loaded the Brompton into the Xtracycle FreeLoader and Anne pedaled up the hill to school. While waiting for her to come out, she unloaded and unfolded the bike. Easy. Smooth. And they were off to the appointment within seconds. Now if we could only reverse her growing doubt that riding bikes instead of riding in cars is in fact, cool. We’ve actually been using the Bromptons like this for a while. Tim started a Brompton shuttle for lacrosse camp this summer, and is doing it again for soccer practice pick up this fall. Heck, it even works if you have to transport a bike for a parent! 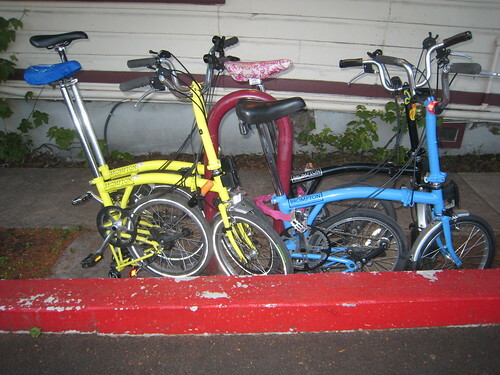 A lot of people doubt the value of the super small Brompton fold, saying the Bike Friday or even a Dahon is good enough. We could carry a larger bike on the Xtracycles, but it wouldn’t be as easy. And we’ve been on some full buses where people glare at the Brompton. A larger bike might just spark a riot! Tim thought he was in the “good enough” camp–his giant size would fit a Bike Friday better–but the functionality of the tiny fold has changed his mind. Contrary to the results of Oregon Manifest, we think a Brompton (actually a Brompton+Xtracycle combo) is the height of flexible, car-free bicycle design. Once you factor in things like no-lock-required grocery shopping and the Brompton’s loaded touring capabilities, and I think you really have another challenger for the ultimate utility bike! This entry was posted in alternative transportation, BIG Loads, bikes, cargo bikes, kids, kids' bikes, sustainability and tagged Bike on Bike, Brompton, carfreedays, Utility Bikes. Bookmark the permalink. Awesome write up! My wife still wasn’t buying it. Plan b was to map out a 2 week vacation to the pacific NW (bimodal bike and amtrak). Once she thought she might have to fight with boxing a bike more than a few times…..brompton purchase approved! Cost of vacation: Who cares? Spouse approved bike purchase: Priceless! That would have sealed it for me as well. Boxing and unboxing and storing boxes, no thanks. Did you already go on your trip? Where did you go, or where are you going? Great post, totally agree that a Brompton plus T-Bag (eww) plus optional ITchair if you have a younger kid is the ultimate urban utility bike. With appropriate cargo bike backup. Our versions of multimodal include all of the above (been loving my work-provided ORCA card plus Brompton lately), and the all-American bike plus spouse pick-up in car version. HA….the 3rd Brompton purchase wasn’t approved until we got to the seller’s house. Tim did deliver a pretty good pitch on the ride over there. 🙂 And I’d bet cold hard cash that he’s looking for a fourth! I’m jealous of the ITchair. It sort of makes me wish our kids were younger so I could use one. Our daughter is just shy of 5′ and the Brompton fit her a year ago. Not sure about the minimum height. I can definitely think of uses for car drivers as well. Think of the parking hassles you could avoid…just keep a few folding bikes in the trunk, park farther away and pedal to your destination. Hi Max – Clever did a blog post a while ago (“who rides a Brompton” http://clevercycles.com/2009/10/29/who-rides-a-brompton/) that includes a second grader who moved from a 20″ bike to a Brompton. She looks pretty small (and judging from her Mom in the gallery photos, they aren’t super tall stock), but she’s riding it fine. FWIW, our B came with lower aftermarket handlebars that the previous owner had installed. I don’t think they made any rear difference — yes, they were lower, but the reach was greater. We’ve now moved back to the standard bars. Other folders may limit you to 5′, but I think you can go smaller with the B.
a few years ago i noticed my kids could bike or scooter much fathers than they would walk. i longed for a small kids folding bike for air travel and getting from gate to gate. almost packed their scooters once but feared theyd run old ladies down so I never tried it. But the idea of using the brompton as cart is perfect! Great idea. I’m sure it would be tempting for a kid to go too fast, but might be worth a try. I saw a kid on a push bike in the grocery store yesterday and it made me smile – I really wanted to snap his photo! Great story. I’ve X’ed our Brompton M6 to middle school to pick up a 6th grader after Jazz Band, and it not only works, but there appears to be a “cool” element to it. Last week I took delivery of a beautiful and functional (big, solid, waterproof, and bright for visibility) Swift Industries front bag, which integrates the Brompton block and luggage frame, and popped it on my wife’s Brompton, significantly increasing the utility and enjoyment indexes. They’re great to have around, these little folders, though you do tend to lose them to kids somewhere around age 10. I want to see that Swift bag! OK, this is trouble. I have already been lusting after a Brompton but kept thinking that I could not justify adding another bike to our fleet right now. Why do I really need a folder? It’s not like I am commuting by train & bike daily. But still…. It has kept tugging at me. And this is partly why… And what? Now a THIRD Brompton! We’ve justified our way into a bike problem. (it’s a slippery slope with no car in the driveway – that 3rd Brompton cost less than a typical car repair). The 3rd joined the fleet a couple of weeks ago (And Tim also admitted he is looking for a 4th). The possibilities for family bike adventures keep getting better!